The brands and agency shared their biggest learning curves on the journey to cutting through the noise. With great disruption comes great responsibility. 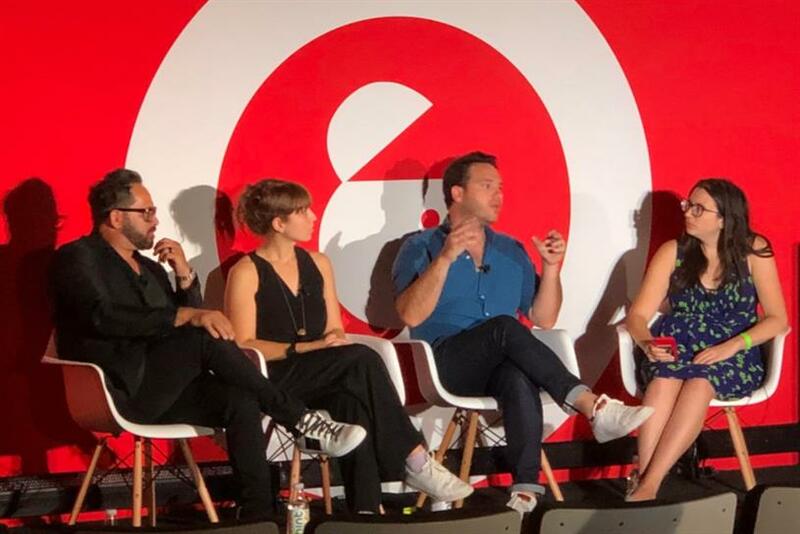 Fiverr, a freelance services marketplace, and creative agency Mekanism laid bare the biggest mistake they’ve made in their quest to be and lead disruptive brands during a candid chat with Pandora at Advertising Week in New York City on Thursday. "If you don’t have the heart for the brand, no one else is going to and it’s not going to work," said Mekanism CEO Jason Harris. "That’s one lesson we’ve learned the hard way." "[In the past] we’ve taken on brands which have had an influx of investment dollars and their disruptive, but in our heart we’re not sure if it’s actually going to work. Sometimes we don’t always take the time to go through that analysis and just take someone on because we won business or we’re hired." Harris said the second lesson he’s learned is that working with those types of brands means that there’s a very high chance the CEO is going to be heavily involved and their team usually dosen't come from a marketing background. This means the process can be more educational and lengthy. "So it’s more of a learning curve," he said. "You have to believe in it and really fight for the work which can be challenging but very rewarding." Asked how brands can stay ahead of cultural trends in a bid to be disruptive, Harris explained that it usually comes down to two major points. The first is ensuring that clients don’t jump the gun and skip educating the audience about its product. He said: "When clients come to us they already have the idea baked. The one thing you see a lot of innovative brands wanting to do is communicate as disruptive... but you have to educate what your product is before you go into some big crazy campaign. We always steer them towards educating people first before you go into the emotional advertising." The second point is steering brands clear of using their CEO in ads. "There’s no longevity in that," he said. "You can’t have consistent messaging over time with the CEO as the spokesperson. This only works if it’s homegrown and they put it together themselves." When it comes to broaching polarizing cultural issues, Harris said brands must build authentic messages into their products, like Ben and Jerry’s Empower Mint flavor which comes from a bakery that helps the homeless gain work skills which empower them to become self-sufficient. "Every brand needs a purpose and their purpose has to be pretty narrow-cast and true to what the brand stands for, and it doesn’t mean to get to comment on everything in the world, only your particular space that you want to own," he added. The sentiment was echoed by Chris Lane, global head of digital and brand for Fiverr. He admitted that drawing a line in the sand can sometimes push more people than one would like onto the side that doesn’t spend any money with you. "People don’t like change," he said. "One of the hardest thing about disruption is ultimately people like their life because they’ve chosen it so the pitfall is in not realizing that it’s a commitment. "People don’t like being told their way of doing something is old, so you have to give them the reason that it’s new, you have to give them the support to go on that mission and you ultimately have to give them the follow-through to tell them that even if the experience you had wasn’t completely perfect the first time, it’s going to be better the next time and everyone’s going to get their together because we’re building a global community. It has to be that true community approach, or else you’re just pitching a product." Chelsea Campbell, creative director at Pandora, stressed the importance of brands aligning with its partnerships. "It’s so important making sure the people you’re working with share the same values and commitments," she said. "We like to go where our listeners are. We think that life is better with music, so if we can find a partner and provide a service where we’re adding music -- that’s a win." She told of Pandora’s recent partnership with Snapchat in which the music platform offered the ability to send songs and playlists via the social brand. Ad-supported Pandora users were given premium access which gave it a wider foothold into the Millennial and Gen-Z market. Campbell explained the need for extreme brand safety when it comes to the placement of ads on Pandora, saying for example it would never play an ad with screeching car sounds through a vehicle device. "We feel a lot of responsibility and we take it really seriously," she added. "Most of our users are listening in headphones, and that’s a very sacred space. You are right there with your listeners. When they’re listening to ads -- which 92 percent of ours are -- they are right there, they don’t need to scream and shout. We think about the whole environment and put our listeners and musicians first when it comes to curation and policing that."